Calling all developers, free thinkers and lovers of money. 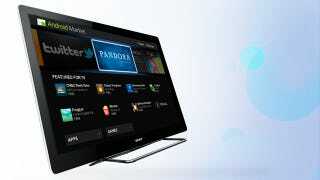 Have you ever tried apps on an internet-accessible TV-like the Sony® Internet TV powered by Google TV™-and just wanted more? While built-in Twitter, Pandora and Netflix apps keep us busy for hours, there's always room for greater innovation and more functionality-and that's where you come in. If you've got an idea for the perfect Internet TV app, we want to hear about it, like, right now. The reader who submits the best plan of app-tack (Ha! See what we did there?) will win a $2,500 gift certificate to Sony. Send a 300-word description to contests@gizmodo.com with "Internet TV App Contest" as the subject line no later than 6 PM EST on November 16, and your app will be judged by a group of highly trained Gawker Media-ites for chance at the grand prize. Standard contest rules apply. Open only to US residents. Readers may also enter by mailing their idea and their contact information to Gawker Media, Attn: Internet TV App Contest, 210 Elizabeth Street, Fourth Floor, New York NY 10012. The contest begins at 11:59am ET on November 11, 2011 and ends on November 16, 2011 at 11:59pm. *This contest is brought to you by Gawker Media. Sponsored by Sony.